When General Thomas Francis Meagher died, he never received a formal memorial. An Irish revolutionary turned exile, U.S. Army general, and acting governor of the Montana Territory, Meagher drowned in the Missouri River near Fort Benton, Montana in 1867, more than 2,000 miles from Brooklyn’s Green-Wood Cemetery, where his wife, Elizabeth Townsend Meagher, would be buried. His body was never recovered and Elizabeth, who was from Monroe, New York and met Meagher in New York City after he fled Ireland, died in 1908, lamenting the lack of a proper ceremony to mark Meagher’s life until the day she died. At 1:00 p.m. July 1, that oversight will be rectified, as Green-Wood hosts a memorial at his wife’s family plot, 150 years to the day after Meagher’s death, that will include the unveiling of a bronze bust and dedicatory plaque at the Townsend/Meagher grave. Award-winning sculptor Michael Keropian, a fellow of the National Sculpture Society, is designing the bust. 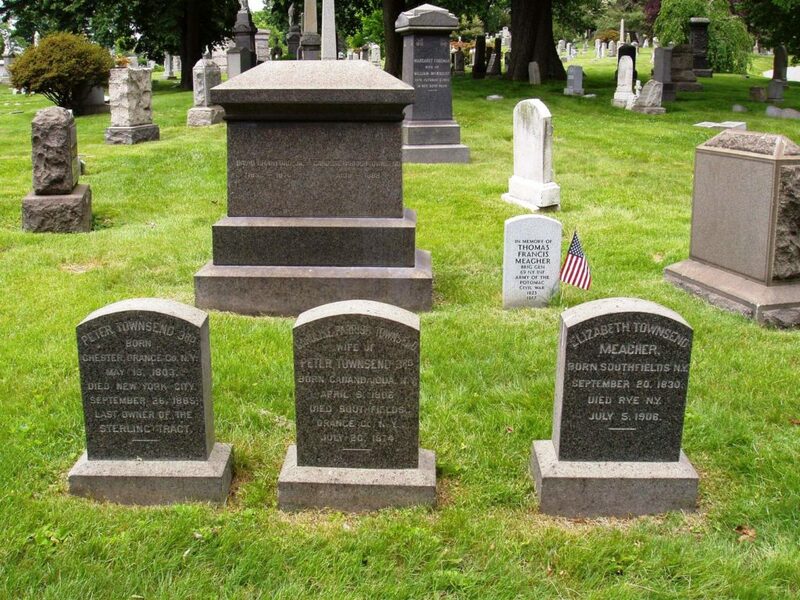 The Townsend family plot at Green-wood Cemetery in Brooklyn, where Thomas Francis Meagher’s bust will be placed. Meagher was a hero of his time and his story has been told numerous times, most recently in New York Times columnist Timothy Egan’s epic biography The Immortal Irishman (which is now being scouted for film treatment by John Cusack – see p. 16). Born August 3, 1823 in Waterford city, he spent his life fighting for Irish independence and American unity, first with the Young Ireland movement and later with the U.S. Army. Meagher participated in the Young Irelander Rebellion of 1848, for which he was tried and convicted of sedition and sentenced to death, but due to public outcry and international pressure, his, and the sentences of his comrades, were commuted to exile in the then-penal colony of Van Diemen’s Land (modern-day Tasmania). Meagher escaped and by 1852 was living in New York. There, he studied law and was commissioned as captain in the New York State Militia. In 1862, Meagher was made brigadier general of the Irish Brigade, made up of the 69th, 88th, and 63rd regiments, and served throughout the eastern and western theaters of the war. He retired in 1865 and was subsequently appointed secretary to the Montana Territory and shortly thereafter acting governor, where his fate was prematurely sealed.